Ms. Butler has been asked to present on how to use virtual debates as part of the Argument Writing as part of Teachers College Reading and Writers Program Argumentation Institution. This is the live debate that occurred between South Orange Middle School's (SOMS) Ms. Butlers 6th grade class and students from Ms. Levines 7th grade. They are debating the merits of homework. The students will be live tweeting and discussing the debate on both Twitter and Todays Meet. 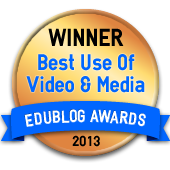 Like what you see remember to vote for the virtual debates in the edblog awards! direction and voting are on the homepage! !